The Full Sweep, presents all twenty-one volumes of Broom, the avant-garde magazine published from November 1921 to January 1924. Broom, along with other periodicals of its era, was instrumental in introducing Americans to European avant-garde art through the reproduction of works by such artists as André Derain, Juan Gris, and George Grosz. In order to show the full range of the innovative art and literature published by Broom, this exhibition presents the magazine’s most renowned works in a display that will change weekly. 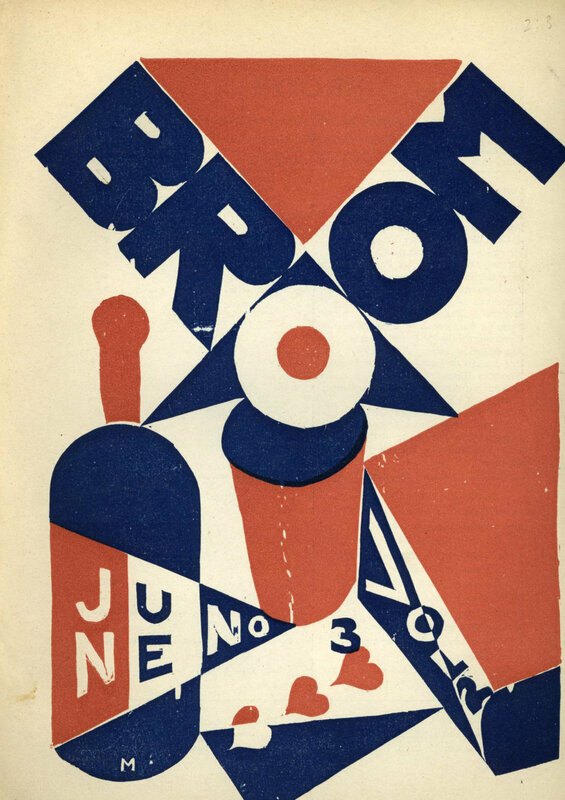 As weeks pass and pages turn, this exhibition will trace the geography of the radical and often controversial works that Broom’s editors championed over the course of its brief existence, before censors and a decline in funding led to the magazine’s demise. The exhibition will highlight original cover designs by Fernand Léger, El Lissitsky, and Man Ray; reproductions of drawings by Henri Matisse, Pablo Picasso, and Amedeo Modigliani; photographs by László Moholy-Nagy and Paul Strand; poems by e.e. cummings, Gertrude Stein, Wallace Stevens, and William Carlos Williams; fiction by Virginia Woolf and John Dos Passos; and the original English translations of works by Feodor Dostoyevsky, Robert Musil, Luigi Pirandello, and Roger Vitrac. Broom was founded by novelist Harold Loeb, whom Ernest Hemingway famously used as the model for his character Robert Cohn in the novel, The Sun Also Rises. In 1920, Loeb persuaded editor Alfred Kreymborg to join him in editing a magazine that would provide a forum for new and experimental art, and with Loeb’s financial backing, Broom set up headquarters in Rome, where its first ten issues were printed. After the first year of publication, Kreymborg left, and Loeb moved Broom’s headquarters from Rome to Berlin, where he published six more issues before his money ran out. Broom’s Associate Editor, Matthew Josephson, took over the funding and moved Broom’s headquarters to New York, where he published five issues, the last of which was banned by U.S. postal censors. Broom: The Full Sweep examines the turbulent story of Broom’s publishing history through an alternating display of Loeb’s correspondence with writer Sinclair Lewis, artists Henri Matisse and Paul Strand, and art collectors Leo Stein and Albert Barnes. These letters, presented in facsimile, tell a behind-the-scenes story of what publishing an international arts periodical in the 1920s entailed.